Blaise Castle House Museum in Bristol (UK) houses a large and impressive collection of 130 European fans ranging from 1700-1950 with 60 brisé and 70 other fans in a generally good condition. This research project explored how to best support this sort of collection by using 3D fabrication technology to create bespoke mounts. At present making mounts for fans is complex and time consuming due to the layering and structure of fans, and the need for accuracy if the mount is to support the fan sufficiently. 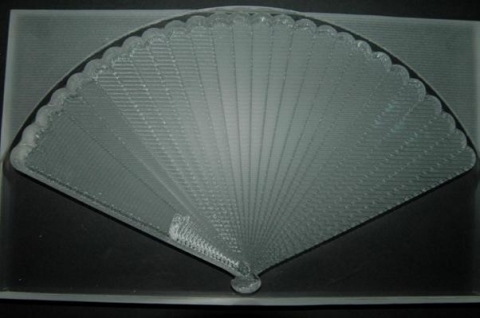 This project explored how creating a digital 3D image of a fan could enable 3D fabrication technologies to be used to produce an exact ‘imprint’ of the object ensuring that all areas were supported, allowing a more suitable fan display to be created. This paper outlines the process of exploring the principles of creating mounts for fans; narrates the process of selecting suitable objects for display, and the process of creating a digitally-produced fan mount. Blaise Castle House Museum à Bristol (Royaume-Uni) abrite une importante et impressionnante collection de 130 éventails européens, datés de 1700 à 1950, dont 60 brisés et 70 autres dans un bon état général. Ce projet de recherche consiste à présenter au mieux ce type de collection en utilisant la technologie de fabrication 3D pour créer des supports sur mesure. À l'heure actuelle la conception de présentoirs est complexe et prend du temps, en raison de la structure des objets, et d’un besoin extrême de précision lorsque l’objectif est d’apporter un soutien aux différentes composantes des éventails. Ce projet explore donc comment la création d'une image numérique 3D d'un éventail pourrait permettre à des technologies de fabrication en 3D d’être utilisées pour produire une exacte «empreinte» de l'objet et veiller à ce que toutes les composantes soient supportées, permettant ainsi de créer le présentoir. Ce document décrit le processus d'exploration des principes de la création de montages des éventails; il s’intéresse au processus de sélection des objets appropriés pour l'exposition, et enfin détaille le processus de création d'un support, grâce aux technologies numériques. How was the Perspex mount created? 2This observation means that from a preventive conservation viewpoint, to display these complex objects, each fan needs to be dealt with on an individual basis. Building up a support relief is both time consuming and has cost implications and isn’t as accurate as options afforded by digital fabrication technologies. For example, using a mixture of digital photography and 3D printing (or digital stereoscopic lathes) enables a digital image to be taken of an object and for that data to inform the creation of a physical mount that supports the fan perfectly. By investigating new ways of developing supports for different types of fans and looking at the cost and time implications, this research aimed to present a valuable, future vision of support mounts for museums that builds on the principles of preventive conservation. The aim of this is to produce a mount that supports the entire fan, looks aesthetically pleasing (so not to distract from the object on display) and also extends the life of the object due to the effective support and monitoring during its time on display. 4The fans to be displayed needed to be in good condition and stable enough to be on display for twelve months. The levels of deterioration needed to be slowed by creating a micro climate within the case and inert materials needed to be chosen that were suitable for supporting the fans without reacting (or causing reaction) with the fans. A CAD (computer aided design) model was then created (see figure 1) that mimicked the shape of the fan; this shape would be inverted to create a mount that supports the individual construction of the fan without creating stress points. When a fan is open it causes stress and is at its most vulnerable, this approach aims to support the fan in its most vulnerable state, providing support whilst preventing movement or slippage. In doing so, “the ultimate goal is to preserve the object’s physical integrity with minimal impact on its structure” (Barclay, R. 1998, pii) by developing a bespoke mount for the fan using 3D rapid fabrication technology. Credits : Catwards Draughting Ltd.
5Fans have developed over centuries with trade, fashion as well as historical and political events influencing the topic and production of fans. “They are a comment on the social scene of the day” (Alexander, H., 1984) with a fan being flicked, fluttered, opened and closed causing stresses and strains to the fan itself. Even in construction fans were put under tremendous stress to achieve a tensioned leaf. 6Fans were made with different materials and processes, often with different artisans working on separate steps. From a conservation view point this creates complexities as the object isn’t made from one material which has a bearing on preventive conservation issues. This presents challenges for displaying fans as the environment needs to be controlled to a stable level in order to achieve the optimum environment, encompassing the individual requirements of each material. 7A folding fan is made up of the sticks and the mount with two more substantial sticks to the outer of each side being the guards, there to protect the inner sticks. The sticks and guards are attached by a pivot which is in two parts and may have a paste stone at the end or other decoration, or a rivet which has a metal post with a nail type head end, decorated with washers in a variety of materials at each end which secures them in place. The ‘Monture’ is known as the skeleton of the fan. Some fans also have the addition of a carry loop or handle secured by the pivot/rivet, with others having tassels attached to the handle as a form of decoration. 8The leaf varies both in material and style, a single leaf fan (called ‘l’anglaise’) with one layer of material allowing the ribs to be seen or a double layer leaf which sandwiches the ribs between two layers of the leaf material. The ribs can be in different materials to the sticks e.g. bamboo which is light weight and flexible. The stick was inserted between the fold of the leaf and glued using animal glue. The leaf shape can vary also but are predominantly semi-circular, with the double layer fans having two designs on them, with the back normally less ornate than the front. The brisé fan is a fan that has no leaf with the sticks making up the entire fan and secured by a ribbon that threads through the sticks. With brisé fans the front pattern is often replicated on the back. All aspects of the construction needed to be considered when creating a support mount. The fan requires support that minimises points of stress. 10By looking at different methods of mounting already used to support fans enabled analysis of how effective existing mounts were, their strengths and weaknesses and how adaption would make them more effective. 11To address some of these issues, Hermans (1992) presented one method using Plastazote that involved drawing an outline of the fan and cutting to size. Exact measurements were taken of one fold and a template was made and repeated in Plastazote forms of various thicknesses. 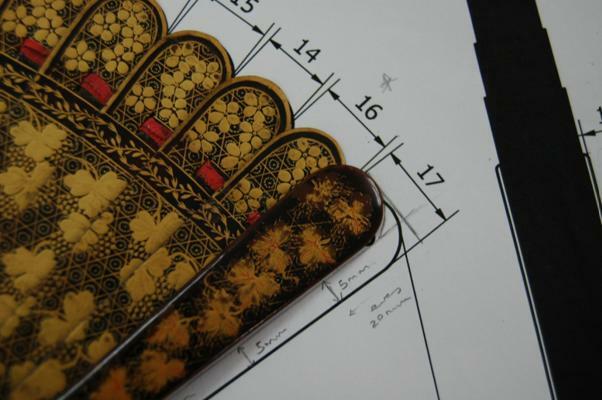 Every fold was marked out by placing the fan on a backing sheet. The fan was removed and the lines were scored, these were then applied with Vinamul 3252, poly-vinyl acetate adhesive and a hot air blower to create a smooth slope which followed the gradient of the fan. With this method an identical increase in both the thickness and height was required with lightly depressed sticks to ensure support. This construction of a support left gaps between each piece of Plastazote. 12Perspex mounts, mentioned in the paper ‘Unfolding the fear: approaching the conservation of fans’ (Amosford and Stephens 2011), were constructed from a single fan leaf shape which was stepped to support the sticks with a Perspex integral shelf and a stainless steel clip to prevent the fan from closing. The ‘Conservation of folding fan’ (Singer and Hermans, 1988) recommended considering each fan individually and creating a support under the guard using pieces of acid free card. It also suggested using a graduated mount which was mentioned to be both time consuming and costly in a large collection. ‘The Language of the fan: A composite object case study’ (Carroll and Young 2002) described a temporary mounting at the Dewitt Wallace Decorative Arts Museum made of fabric-covered rag board where the fan sticks were sewn to secure the fan at three points. This method distorted the fan’s 3D contours, causing aggravation of the leaf’s tears. ‘Design and Construction of a support for a folding fan’ (Manson 1986), outlines that the structural strength of the fan was the head and that the weaknesses were the folds of the leaf. It covered the importance of developing a support that used safe materials, was unobtrusive, flexible in design so that the fan could be displayed vertically or horizontally and allowed viewing to prevent further handling of the object. 13In developing a new technique for fan mounts all of these points were compared. By comparing each method a common theme of graduating Perspex was explored and adapted to follow the profile of the fan using 3D fabrication. Building on the themes within the literature on fan conservation and applying them with digital fabrication provided the opportunity to develop a new method of creating bespoke fan mounts. 17Other museum’s fans on display indicated that there may be sagging and potential warping to the right guard stick due to the lack of support (see figure 2). 20When assessing a fan it can feel unstable in the hand, the sticks can feel unsupported when open and it can have the desire to twist. The pivot area caused the fan to want to arch in a convex manner and the nature of the gradient of sticks caused it to change shape. Fans are fragile due to their process of manufacture, function and wear. The head of the fan takes the load or the fan’s weight and the nature of the fan folding up to close meant that retainers either side of the guard sticks might have been required to stop slippage if displaying on an angle. 21By having a mount that mimics the shape of the object, the fan can be fully supported. In doing so, it would minimise the stress as the whole surface area of the object is supported. 22An object requires support and prevention from toppling over or slippage and needs to be balanced; therefore the centre of gravity needs to be considered when designing a mount. Although gravity will pull downwards, vibration from visitors also needs to be considered so the object isn’t displaced from the mount. The degree of elevation also needed to be considered from a display and conservation view point. The visitor needs to be able to see the fan sufficiently but also the fan needs to be stable at a degree that is both comfortable to the viewer and the object. 23The head of the fan (where the majority of pressure lies) needed to be supported with no area cut away. This area is often left unsupported as the pivot head is awkward to support when ensuring that the rest of the fan is flat. However, in principle, the mount should support this area as well. 24The fans were carefully selected through a number of processes, firstly all fans were photographed and documented to record which ones were suitable for display or which were too fragile, damaged and required conservation treatment. 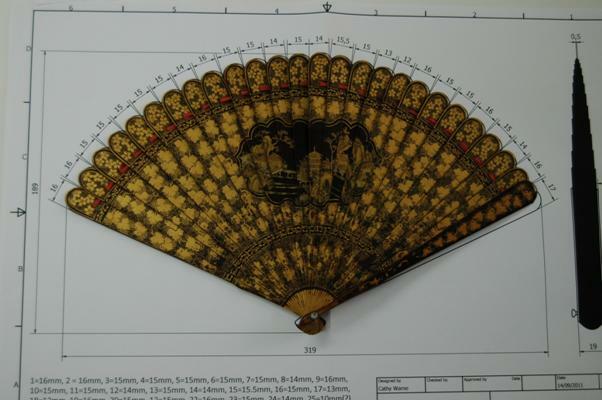 The selected fans were then compared against the museum records to see the extent of the information on the fan. Originally fifty were selected which were reduced to twenty five and finally ten. The decision to choose fans that were in good condition was an important criterion as “folding fans are weakest when open, with the leaf fully extended and exposed” (Burt, Y., 2011). Also the decision was guided by conservation concerns regarding stability, materials and display, conservation repairs, and finally dates as a cross section of periods needed to be achieved. As the fans were made up of organic materials the display was for a maximum of one year, whilst ensuring that natural degradation wasn’t increased through controlling the case environment. 26Due to the complex nature of materials and their individual environmental needs, research was carried out into all materials within the fan collection. By researching into individual materials; their compounds, temperature, RH and light level requirements, conclusions could be drawn. 27Three dimensional printing has been previously used within museum environments to create missing pieces to artefacts e.g. archaeological digs, to inform the public of what the object would have looked like previous to deterioration1. It has also been used to create virtual models and record an objects current condition allowing monitoring of deterioration. However, using this technology to create supports that provide full support to objects had not yet been explored. 28Rapid Fabrication technology2 is the use of 3D imaging to create an object through printed layers. “We define 3D printing as any additive manufacturing process whereby one machine turns a digital file into a finished physical object by building up that object layer by layer. If you were to be more precise the technology would be called rapid manufacturing and 3D printing would just be one of the manufacturing processes used to create objects in this way” (http://www.shapeways.com/​about/​how_does_it_work). 3D printing allows quick production, cheaply and allows concepts to be tested. 29Ravensbourne College, UK has a 3D rapid prototyping suite. Jake Durrant, Senior Lecturer of Prototyping describes this Prototyping Department as “a cross college facility that allows the creation of prototypes using state of the art Rapid Prototyping equipment and techniques. From CNC milling machines and 3D printers to textile printing and 3d scanners we are here to support the students in their endeavours but not to come between the students and the process; there are no technicians; there are no staff only machines”. Initially Will Pearson, Director of Technology at Ravensbourne College was contacted and a meeting set up to discuss the possibilities afforded by this technology. After discussing technical issues it was decided that creating a digital 3D image of the fan would enable the shape to be inverted, providing a support-shape that could be created through digital fabrication. Three methods could have been used to create a 3D representation of the fan. The first used a hand held scanner with “a low power laser beam, the surface of any object can be precisely measured and recorded in three dimensions, without any contact with its surface. The process is completely harmless. A laser scanner projects a thin strip of low power laser light onto the surface of the object. A digital camera records the light as it is reflected from the surface. The relative positions of the light source and camera are known. This allows the surface of an object to be mapped as a series of 3D data points, called a 'point cloud'” (http://www.liverpoolmuseums.org.uk/​conservation/​technologies/​3drecording/​). It takes many photographs per second and scans the 3D data in a grid system and then these are stitched together and cleaned up to get rid of noise or interference from the image therefore creating a solid image. The second option was the use of photography to take images of the object and to stitch the digitised photographs to create a three dimensional image of the object. To do this it was necessary to photograph the object on gridded paper with a rule on the length and width axis to provide dimensional details. 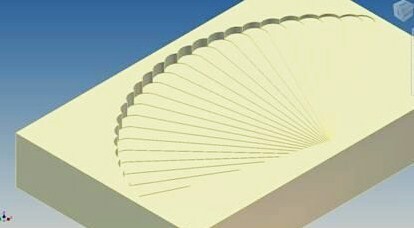 A third approach was to take accurate measurements of the fan and to use them to recreate the shape as a computerised 3D model. The prototypes are normally produced in foam initially to ensure the exact dimensions are taken and the object receives the correct support. This can then be adapted until all the specifications are met and then printed out in a chosen material. There were three techniques for 3D printing: the first used a powder substance and an inkjet printer head to glue coloured layers together to form the 3D shape; the second used many sheets of paper and glued together to form a shape; the third and final process used resin to create a 3D shape and can be used for injection moulding and snap fix kits. Due to the importance of using inert materials using the 3D paper printing technique was disregarded due to the levels of lignin and the glues used. 3D printing using the inkjet printer head was discussed and COSHH reports had to be viewed to see what glues and inks were used in this process. As the mount would be in contact with the object in (this case a fan) the most likely option for further exploration would be to use the 3D resin printer as an option. One option was to use a 3D printing approach using ABS- Acrylonitrile butadiene styrene, a common thermo plastic (C8H8)x·(C4H6)y·(C3H3N)z). However, in order to undertake this approach, further tests would be needed to investigate the deterioration of ABS with an Oddy test being performed to conclude whether it was safe to use if in and around the object to see if there are reactions or emissions. From this it would be decided if a barrier was necessary. 30However, an alternative digital fabrication technology, stereoscopic lathes, provided the most appropriate methods for taking a digital image and creating a mount. The process used a Roland MDX540 which is a milling machine that uses SRP technology (Subtractive Rapid Prototyping) which enables you to start with a solid object, in this the case a Perspex block, and remove unwanted material. This process is cheaper than additive technology and has more precision, a better surface finish and enables the use of a wide range of materials. The machinery software used was Mayka Pro, CAM- Computer Aided Manufacturing software that controls the milling machine in the manufacturing process. One of the main reasons for using this technology is that it can be applied to Perspex, an inert and safe material to use from a conservation view point. Research on Perspex suggested that Perspex will expand and contract 0.7mm for every 10°C increase or decrease in temperature. As it is a soft plastic it can scratch easily and is prone to build up static which can attract dust and even take small fragments from the object. Static occurs in a dry atmosphere so prevention of this situation is beneficial especially to the object being displayed on it. The design of the fan support would need to take this into consideration. 31By approaching several 3D fabrication companies three options became apparent to create a digital image of the fan. The first was to scan the object to record all the data using a 3D scanner. This process analyses the object, collecting data on its shape and appearance which can then be used to create 3D digital models. Although this would quickly create a very accurate digital model, the complexity of some of the fans (especially those with feathers), meant that this approach was discounted – however it presents useful potential for a range of other historic objects. The second option would be to take multiple digital photographs of the fan and to create a 3D model using computer aided design3 (CAD) software e.g. Solidworks which is a three dimensional CAD program, that can draft a design, taking into consideration materials, dimensions and purpose. The third option was to measure the fan carefully and to use those measurements to inform the creation of a 3D digital image using CAD. 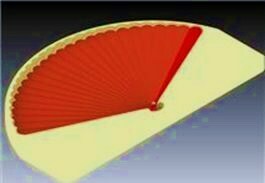 32After discussing the potential with a 3D model designer at Catwards Draughting Ltd., it was decided that taking dimensions would be sufficient to produce an accurate profile for a fan mount. This involved taking many measurements, concentrating on the stick size, thickness, distance apart from each stick, with as much detail as possible on the pivot, pin and head of the fan as well as the overall size. 33In order to create a digital version of the fan, precise measurements were taken using rulers and callipers to gain accurate results. All measurements were taken a number of times to confirm accuracy. The following figures 3 and 4 show the measurements needed along with the impact historic use has had on the shape and dimensions. It was only once this image had been created that the inverted mount could be designed. 34Figures 3 and 4 were sent to Catwards Draughting Limited with the results from the measurements of the fan. 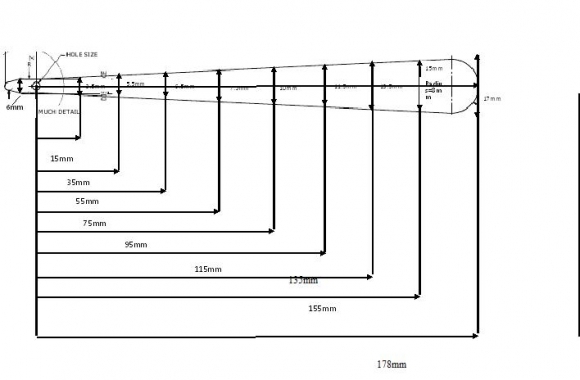 Credit image : Catwards Draughting Ltd.
35Figure 3 shows the measurement of the width of the fan and the distance the measurement was taken from the pivot. Measurements were taken at 20mm apart (expect from final blade). 36The overlap was measured at the widest point (8mm from stick tip), with detailed recording starting with the stick furthest left and moving clockwise. The results are below. Due to the wear on the ribbon, the fan does not open evenly as the measurement of each stick varied. 37Below figure 5 shows the angle on which the pivot occurs, this tends to twist although stays at a right angle. 38Below figure 7 shows the pivot head raised at the base by 2mm which affects how the fan lies. This image also demonstrates the twisting around the pin. 39Figure 8 shows the initial prototype created after initial discussion. The diagram formed part of their quote and the basis of informed adaptations to the design. 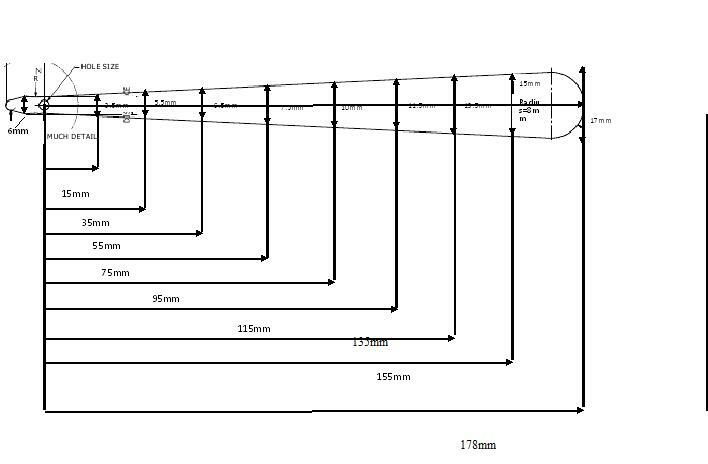 40Following these discussions and taking extensive measurements, the first sample CAD file was generated (figure 1). This shows how the fan model would be inverted to create a support for the fan. 41Design drawings were sent through and a 1:1 scale of the fan was sent and checked against the fan at Blaise. 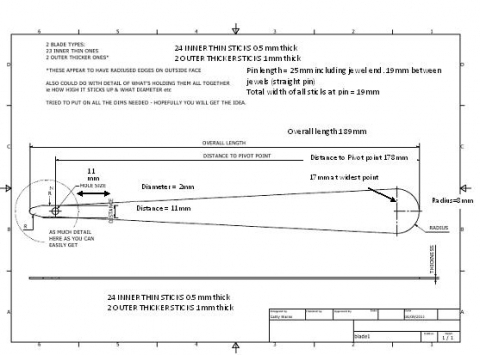 Also the drawings were checked for their measurements and data and confirmed with Catwards Draughting. 42Final adjustments were made when comparing the 1:1 scale drawing to the actual fan. 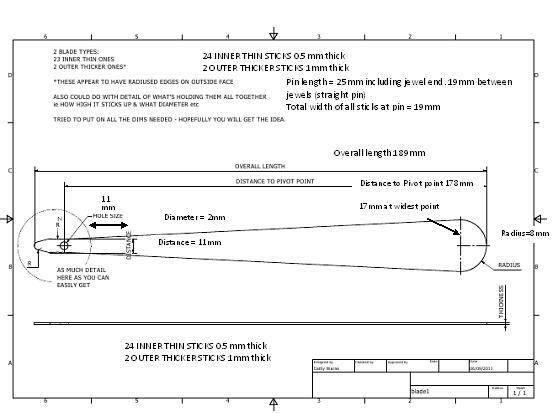 The only alterations required were to stick 25 from16mm to 13mm and 26 from 17mm to 16mm which can be seen in figure 9. The decision to allow a 2mm allowance was reduced to 1mm after careful consideration which would allow the expansion and contraction of both the fan and the mount. 43Once all the information was in place an STL file (Standard Tessellation Language is a format used for stereo lithography CAD software and commonly used for rapid prototyping) was created ready for production. 44At Ravensbourne College Jake initially set up the machine and the block of Perspex was fixed in position. By measuring and getting a block piece of Perspex cut accurately to a size of 350mm x 270mm x 25mm meant that this process took about forty five minutes to an hour. 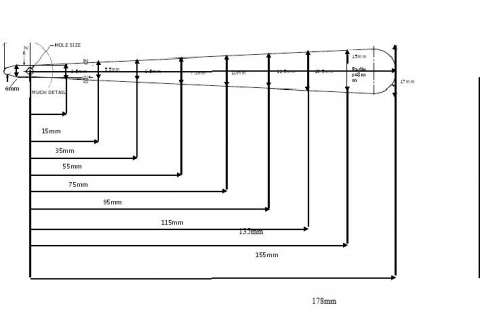 To generate a toolpath (a series of co-ordinates determining the movement of the milling tool during machining) within the software took about thirty minutes. Running the machine and observing the first couple of passes of the tool took fifteen minutes. The machine then ran for approximately six hours and at this point a smoothing pass would have been set up to reduce the roughness and refine the surface which would have taken a further thirty minutes to set up with a one to two hour processing time. However due to problems with a new blade it caused punctures in the Perspex so the prototype mount machining was stopped (see figure 10). These problems were rectified and wouldn’t occur when the actual mount was produced. Overall to improve on the prototype the block of Perspex needed to be 5mm wider all the way around to make the milling process easier. In addition to the time taken to this stage, further effort is required to smooth the edges of the mount and to cut the arch shape at the top of the fan mount. 45Future research needs to be developed into the effect of composite objects being displayed and the effect the mount would have on the fan in terms of display length. On an advisory note a fan is made up of composite materials and therefore should be treated individually on a case by case basis. Expanding research into 3D fabrication would mean the possibility of creating supports for a range of museum objects. Refining the method to conceal the mount as much as possible will always be key. Cost will also be a major factor and as this is a relatively new technology initially the cost maybe too high to produce a Perspex mount using 3D milling. However using a printed technique is both quicker and more cost effective but the materials used and the process would need to be investigated further in terms of Oddy testing the materials. 46In terms of improving the research, further investigation into different techniques of 3D fabrication would be carried out with the testing of materials with support from a materials scientist. Similarly, investigation of how 3D scanning could be used could offer ways to record the data slightly more precisely and quickly to create an even more accurate support. 47Although this project has only scratched the surface of the potential to create 3D fabrication mounts, if a printer and scanner was accessible by a major conservation organisation, bespoke mounts could be made to order. This process would see the need for a conservator to inform the support design; a CAD designer to operate and design the file, and a fabrication expert to create the support. This new collaborative approach to conservation that builds from design, computer science and conservation expands the possibilities for conservation care and practice. 48Through looking at methods of display and previous research it has enabled conclusions to be drawn regarding support techniques used for not only the display of fans but the storage aspects too. They have similar attributes in providing “a smoothly graduated surface which will support the sticks equally when the fan is opened out” (Landi, S 1999, p172). 49Overall using new technologies of 3D fabrication has enormous potential for both conservation and the heritage sector as a whole. It could mean that objects are scanned to create simple bespoke supports that could invest in prolonging the life of the object on display e.g. life size mannequins could be produced for costume allowing a custom fit scanning in a human and printing off a whole person. As this is an emerging technology it would initially require large investment from museums and heritage sector businesses to purchase the equipment and materials or to create new collaborations with institutions such as Ravensbourne College. As technology is developing at a fast rate, equipment such as scanners and 3D fabrication printers will reduce in price making it a more viable option for the future of supports and could become a way of prolonging the life of an object through completely supporting the object regardless of scale or shape.